Schools and Early Learning Centers Solutions - Mega Dough Fundraising - Simple. Profitable. Creative. Here at Mega Dough Fundraising we are proud to be the national leader in school fundraiser programs, using our nearly 20 years in business to put forth the most complete list of school fundraising ideas on the market. From cookie dough, cheesecakes and pretzels to candy and candles, we have widest selection of fundraisers for schools programs anywhere. Not only do we strive to put the benefit two decades in business to work for everyone from church groups to high school fundraisers through our diverse array of product, but we also offer complete sales and support staffs that can help assure the success of each and every one of our customers. While our products are all mouth-watering and delicious, few products in the world will sell themselves. We are well aware of this, which is why we offer a full range of support services to help you both maximize exposure and profits as well as solve any problems that may arise. These invaluable employees have spent years helping people conduct fundraisers for schools and they see it as their mission to help all of our customers to be successful. Our product line is extensive, and whether you are in charge of an elementary school fundraiser or high school fundraisers trying to generate funds for a senior trip, we have something to meet your needs. This list of school fundraising ideas includes cookie dough, candy, cheesecakes, pretzels, candles, sauces and gifts, allowing you to tailor your product to the market you are hoping to target. Between this outstanding product line and even better support staff, we have rocketed to the forefront of the fundraisers for schools industry, leaving thousands of customers who have raised millions of dollars in our wake. 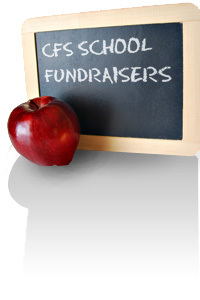 Contact us today and we can get the ball rolling on your school fundraiser program immediately.